If you haven’t seen it, check out The Outreach Marketing Virtual Summit (it’s free) – it includes key information from a whole host of experts. There is so much great information in this free event – it’s incredible. This was a project by GroupHigh, an outreach marketing firm that rocks working in this space. They have a great toolset, and the series of sessions they put together are excellent. There is also a session there by me (Stephen Wynkoop) about virtual events and how they work in the marketing cycle. What’s more, you can see the platform in action and check out some examples. So I talked about the importance of video in creating an engaging presentation. So for this last article let’s get into some real world HOW. Scenario 1: Your online only event has 6 different presenters. The budget won’t allow for in-studio professional video production. They all have slide deck presentations and want to stick to that plan. The presenters are all in different areas of the world, but you want to give the event a cohesive feel. Solution: Not a problem! We have a tool that allows presenters to record their desktops to include slides, full motion computer demonstrations and yes, their webcam! You arrange for a slide deck design treatment that they all use and you make suggestions for webcam placement and lighting in a simple to read document that we provided you. The speakers make quick test recordings and send them in for approval. Everyone agrees it looks and sounds good. They go about recording their full presentations and you smile with satisfaction in a job well done. Scenario 2: Your in person event is going to include a bonus online event. You need to record and document all presentations and the keynotes. You’d like to offer the online event a week after the in person event for anyone who missed anything. Both in person attendees and non attendees. Solution: We discuss your needs and decide that you need a multi-camera production. Our crew designs a production equipment package and travels to your event to record the show. We work closely with your team to ensure that all required moments are captured and we setup the event online to allow for scheduled playback of these videos the following week. You just grew your event attendance, not to mention your event’s income. Scenario 3: You’ve decided you want to take that same event to the people live over the internet! Solution: We add on a live streaming package to the already fully planned production package and you have created urgency and excitement for those that couldn’t attend in person. Scenario 4: You are having an online event with your company’s top executives. This needs to be polished and professional. Production quality is very important. The event will be live with on-demand versions of the presentations available after the live event. Solution: We invite you out to our production studios in Tucson Arizona. Our producers work with you to decide show flow and set design. The required content and rehearsals are scheduled. Everyone knows what is happening when and where they should be. Our well designed studio gives your event that high end look you were after and your executives appreciate the chance to tee off at some of the world’s best golf courses after the event. I could go on and on as there are many different scenarios. The point is that we can handle any of them and we help you along the way. That is a major separator for us as a platform provider. I hope these quick articles have been informative, or at least entertaining. “Like TV”. I will admit right off the bat that I am a bit biased towards video for online events. “Like TV”. By which I mean seeing a person’s face not just hearing their voice. But ask yourself… which do you prefer? Static or moving images? I mentioned in an earlier article that static slides and telephone audio probably aren’t the ideal format for your next big online event. However, there are some key points to consider when you are thinking about your event’s playout format. First and foremost, what does the content call for and how do the viewers want to take it in? If you’ve got nothing but computer code and script syntax to cover, there may not be a chance to see the presenter’s face much less put him/her in front of a camera. On the other hand, if you’ve lined up a big name (and they are not presenting loads of text) then you are probably going to want to put that persons face front and center and let other materials like slides play a supporting role. A good example is the TED talks. If you’ve seen one you know what I mean. They are interesting, engaging, and nice to look at. Now imagine that you only see bullet point slides and their voice behind that. The subject may still be interesting, but you’ve lost the engagement and immersion. Just a little side note: Personally, I don’t get event platforms that put all the content up in front of you at the same time in so many little windows. The problem I see is that there is no main focus. This probably comes from my training in both cinematography and design. It is important to direct the viewer’s focus. It’s much easier to take in information when it is presented clearly and your attention is directed in one place. If I’m looking at a slide deck window, a video player window and any other assortment of “supplementing materials” windows, my focus is never on just 1 thing. The human eye will wonder when allowed. I prefer a “like TV” approach where you get one screen and that window is your focus. What you put in that screen is up to you. Arguments can be made for both sides, but that is what sets us apart from many other platform providers and we like to think it’s the best way to deliver engaging content. Ok, so I said there were “some” key factors which would imply more than the one I just described. Secondly, Is it possible? Can you actually get the presenters to use video? I say, “where there’s a will there’s a way”. Not every session has to be a huge multi-camera production. Keep in mind that even a webcam is better than no cam at all. Giving your viewers something to connect to besides text is a big part of immersion. Ok, sales guy hat on for a second. We have a full HD production facility that is purpose built to deliver presentations. As our client, you have access to those facilities and our production staff. Also, there are plenty of free lance video producers who can help. Beyond that we offer tools that allow for self recording that are easy to use and can help you avoid bland presentations. I understand that wrangling speakers alone is difficult, much less trying to produce video, but that’s what we are here for. It’s what we do and we would love to help you take it up a few notches. Off with the sales guy hat and on with the video guy hat again. Quality is important. It sets a level of respect for your brand’s reputation. The world is full of boring slide deck presentations. You don’t see anyone commenting on social sites about the latest PowerPoint preso they just saw. Pay special attention to producing creative, engaging content and step outside of the box a bit. In the next article we’ll get into some technical stuff. That’s what this is supposed to be about right? The good news is you have options. The other good news is that it’s not hard to choose your option. I’ve seen many types of events and helped produce content for all of them. The important thing to remember is you have to make your content available in a manner that suits the information presented and in a format that your audience wants to consume it in. You run a yearly conference. Typically you get 2000 attendees to your 3 day conference in Las Vegas. Your attendees are used to days full of educational sessions and exhibits. We won’t talk about the evenings cuz what happens in Vegas stays in Vegas. You don’t want to alienate the crowd that attends the in-person event, but you know there are thousands if not tens of thousands of other interested people that couldn’t make it for 1 reason or another. If you were to do a hybrid event that runs alongside your in-person event you might stream live video broadcasts of the keynotes or sessions. You could offer online exhibitor booths and charge a fee for all those attending online. Or you could use it as a free teaser and limit the content to entice possible in-person attendees to your next event. Your company needs to train new sales staff around the world and you’ve been asked to cut costs on the training program. Why send trainers all over the world for days on end at high cost to deliver the same information over and over? Do a continuing education event that is ongoing and place training modules and videos on-demand or scheduled with trainers manning the chats. Still need that person-to-person training? Trim down the amount of time needed by placing the material that doesn’t require person-to-person in an online event. You need to market a product or service and your company wants new marketing avenues. Do a webcast where you have an expert in your industry do an informational talk on your product and make it invitation only or release it to the whole world to watch whenever they want? Further, don’t just do slides and a phone call, make it a video where you can see the presenter. Webcasts and webinars are great for fostering interaction with potential customers and clients. Keep an open email portal for the on-demand period so potential customers can contact you with questions and see other viewers questions and answers. These are just 3 examples. There are many other possible scenarios and each event is a little different. I’m really trying not to be a sales guy right now, but I have to say that that is why our platform can be a great choice. We are not a template you plug your info into and push go. We really do work with each event to help you pick the delivery, format and options that best suit your event. I’ll get off the sales horse now and get on my video producer horse for a minute. It’s important, now more than ever, to create compelling content. Viewer expectations are up. Slides and telephone audio aren’t going to do the trick like they used to. Video production can be had for little investment and it makes a world of difference in keeping your viewers attention and instilling a good impression of your organization. Granted, it’s not always the best way and at times is just plain overkill. Either way, always keep in mind how your viewer wants to consume the information you want to deliver. That takes us to the next Article: Scheduling… Live, Simulated-Live or On-Demand. Is Your Virtual Event at the End of the Marketing Cycle? One thing that seems to come up quite a lot is that marketing leads up to the virtual event. The event is the target or goalposts for the marketing work. People get all involved putting together the different campaigns that will support the event, make sure the word gets out, etc. Your event should reinforce your messaging presented in your campaigns – it should provide additional information for attendees and provide them a “what’s next” plan – should they contact you? Will you be contacting them? What is the purpose of the contact? For example, if you’re event is in and industry you provide a service for, the next steps might be how you can help the attendee apply the things they learned at the event. This helps them get started and realize the value of the event. Your event can provide opening comments to talk about the things that will be presented, then closing comments to talk about application of those items. Close the circle, help attendees get their arms around what’s been presented. You can help with this by organizing your event into sections, tracks or rooms depending on how you’ll be doing your event. Consider a pre-event webcast or short video. This will help attendees get moving on their understanding of your content. Pre-publish your slides, if possible. This gives you another touch point with attendees, and it helps them come to your event with your messaging in mind, and they’ll be and feel more prepared. You can, of course, use this as a good point to not only point out the slides available, but point them in the direction of your site, your blog or other items that are helpful. Contact attendees after the event – let them know where they can watch on-demand, let them know about related items on your own site or blog – basically connect the dots between the event and your offerings. “We had a great session (watch it on-demand here) about XYZ – when you’re finished watching, be sure to check out my blog post on the subject here” — that type of thing gives attendees a good handle on the items and helps move them beyond the event with a purpose. Consider offering sessions from the event as exclusive webcasts – you can run them in the future to reinforce the value of the event content, to re-establish contact and provide information to new potential attendees for your next event. 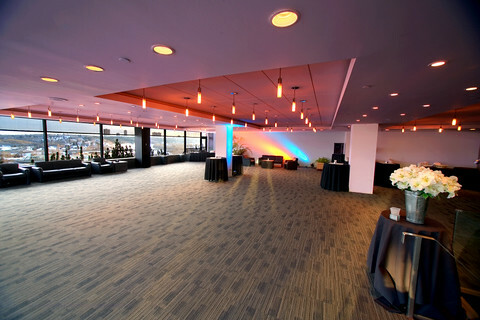 Essentially, the big takeaway is that you want to make sure your event is PART of your overall plan, not the endpoint. It’s much more valuable to you, and your attendees, if everyone is able to connect those elusive dots. I realize that the name of our platform might lead some to think that we only do conferences online. I assure you that is not the case and my bosses didn’t make me write that either. There are many different types of events that can be done online. I’ll get into the types we work with most often. Starting with the most obvious… in person events. These may be the most popular and well known types of events simply because there are so many and they generally happen in every area of interest. From finances to comic books, there are people with like interests that need to gather and communicate. For the most part these consist of keynote sessions to start off and general sessions combined with a show floor or exhibition hall for vendors to tout their offerings to attendees. Depending on the area of interest you’re probably going to a conference for the sessions or the exhibits. A subgroup to conferences would be shows or exhibition events for vendors. The attendees at these events only represent a very small portion of the actual audience for their topics. Many can’t get away from their daily lives or simply can’t afford to travel and attend. This is also a very popular type of event. In most professional industries there is some sort of Continued Education implemented to keep pros up to date. There are requirements and standards that must be met to qualify for these CE credits. Professionals are usually busy, and time is money, so fitting in travel or even leaving the office for CE is usually a struggle. If you are starting to see a trend I’m hoping you are starting to see the advantages of Online Events. Factor in time and costs for travel, food, lodging and attendance charges and you may see why in person events have seen a decline in attendance. I said all of that to say this. Give the people what they want. In today’s world, individuals and businesses are accustomed to instant gratification. Everything is at their fingertips thanks to the internet. If your information isn’t easily available to the world they will find another option as quickly as type, point and click. The good news is all of these events and more can be done online. Any craftsman knows that you need to use the right tools for the job. In the next article we’ll start to talk about what type of delivery suites your information. Before we dig into the more technical stuff, I have to get this out of the way to be sure we’re all on the same page (No, my bosses did not make me write this). Chances are, you’re reading this because you have something you need to distribute to an audience. It’s also possible that you are considering distributing it via a “virtual event”. Before we go any further I should clarify what I mean by virtual event. To me (YMMV*), a virtual event is a happening that people attend online or over the internet. This could mean a presentation, a meeting, a learning session, or a time and place to eat pizza together… virtually. The sky’s the limit! It’s also important to note that I personally think that the word “virtual” when applied to an event sounds a bit like we’re all going to play a game in a 3D environment so I will substitute the word “online” for “virtual”. Call me crazy, but it makes more practical sense to me. 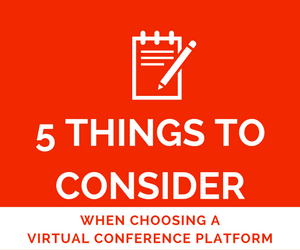 In our case here at vConferenceOnline, the need for online events came about via conferences. Organizations usually have members and interested parties. These entities need a way to communicate with each other and share their information. In the old days what we now call “in person” conventions or conferences were organized in large cities where people would come from all over to take part in the “event”. This also applied to meetings, continuing education, and many other forms of organized events. This worked pretty well for many years. In recent years event organizers have seen their “in person” attendance drop. People were busier than ever and their time and budgets were limited. A solution was needed… “Hey, what about the internet?” Online events were born. It became possible to include many more people in the events by offering a “virtual event” online to those who could not come to the “in person” event. Today, some choose to do online events alongside in person events. Some do them at separate times, and others do online only. There are many factors (which we will discuss in future articles) to consider when deciding HOW you will do your event. Overall, the main reason WHY you should do an online event is to widen your audience options. From there the rest starts to make more sense. In the next article I’ll discuss types of events and how you might choose what is right for you. As a provider of virtual events, the company I work for has a vested interest in putting “the right foot forward” in these articles. That is my disclaimer and I’m sticking to it. On the other hand as a technical staff member for said company I am able to offer a slightly less marketing/sales perspective on the whole thing. Which may be why my wise bosses asked me to write this in the first place. You’ll probably find these articles to be mostly about the “production” side of producing events. Which is where most questions arise once the overall concept is understood. Just a little info about me so you get where I am coming from. I love all things technology, digital and analog. I grew up taking things apart and putting them back together (although sometimes as different things). When digital became a reality it opened a whole new world of possibilities for taking things apart and putting things together (although sometimes as different things). I started playing with machines when I was young. Coming from a musical background, I enjoyed the engineering side of audio. This lead to enjoying the engineering side of video. All of that lead me to where I am now with vConference Online as a content producer for video. Now a little history on vConferenceOnline. Founded by Stephen Wynkoop, our parent company, Bits on the Wire, was working on a project for a community site we own known to the Database world as SSWUG.org. We wanted a way to share all of the technical knowledge from our partner experts in a way that was intriguing and interesting. Further, we had learned that people like to watch way more than they like to read (exceptions to every rule of course… as you are reading this). We decided to take what were daily audio podcasts and make them into a video show, “Like TV” said Stephen with a twinkle in his eye. That’s where it all started back in 2006. Online video was just starting to poke it’s head out along with the infrastructure to support it. What we found in that particular space of technical learning was a lot of telephoned in audio and slide presentations, with little to no production value. We set out to change the way techy’s take in their techness. We said, “Let’s take broadcast level production and merge it with top end IT knowledge. People will love it!” So we started with a small camera, a green screen and a lot of really hot lights. The first virtual event we did was in Spring of 2008. We had 1 camera, a plasma screen with slides, and a huge desire to show the world that technical presentations didn’t have to be mind numbing. 1 year later we had grown from 1 10×20 foot room to a 4500 sq ft office with 2 full studios. Then we had another great idea (pat selves on back)… “We have this platform for virtual events built, why not let the rest of the world in on it?” That’s where vConferenceOnline was born. The whole premise behind our virtual event platform was to offer HD video with supporting materials like slides rather than offer slides with supporting thumbnail video. We built studios with one purpose, to allow presenters to show their computer screens and slides while making a connection to their audience via the camera. “Like TV” said Stephen with a twinkle in his eye. Many events, clients and features later, we feel we have one of the best (if not THE best) platform for online events. In this series of articles I’m hoping to walk you through the production side with a tiny bit of marketing and sales on the What, Why and How of virtual events. Stick with me, this is going to have a lot of quotation marks and parenthesis. One of the biggest challenges during an event, whether it’s a webcast or a virtual conference or… whatever you may be doing, is keeping the attention of your attendees. After all, Facebook beckons! There are many things you can do – but you need a good mixture of options. Some people love taking in the video, others want to follow along with slides, still others want related tasks. One idea that can help is email during the event. Keep in mind that your attendees have many things on their respective plates. Chances are, they’re keeping track of their email as well. You can play to this a bit by sending out emails with additional information during the event. Perhaps an email to those that are in a specific meeting at the time, or to those that visit a booth. You can use email touches to provide quick tidbits and suggestions – perhaps additional tips, best practices or other ideas that go in line with the presentation. You can even link to specific assets in the event and let them download them. These emails are great touch points for offering check lists and other items that support the materials presented. What you’re looking for are reasons to keep the attendee engaged. A little tidbit here, a tidbit there and they will begin to really see additional value from related elements in the event. This is really helpful when the sessions build on one-another as well. Perhaps send out a session track map – one that shows how the current session will lead into another, with a preview of what to expect. The key is to make sure the attendee knows all they can get from your virtual conference or webcast/webinar. Many times people are so caught up in getting into the event and getting settled, then getting distracted, that they don’t realize they can get slides, can watch a short, related video or that there is a method to the madness of the session schedule. This is also a great time to have the email include information about sponsors in a subtle way. It’s more of a product placement logo footer than a “Go check out our sponsor” type message, but it’s valuable and reinforces the brands associated with your event.